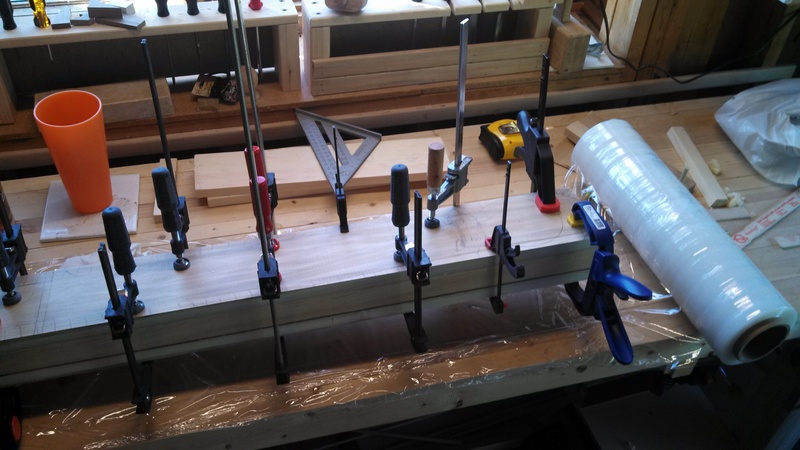 Okay, so if you follow this blog, you’ll know that last year I built a leg vice and attached it to the workbench I built over the summer. 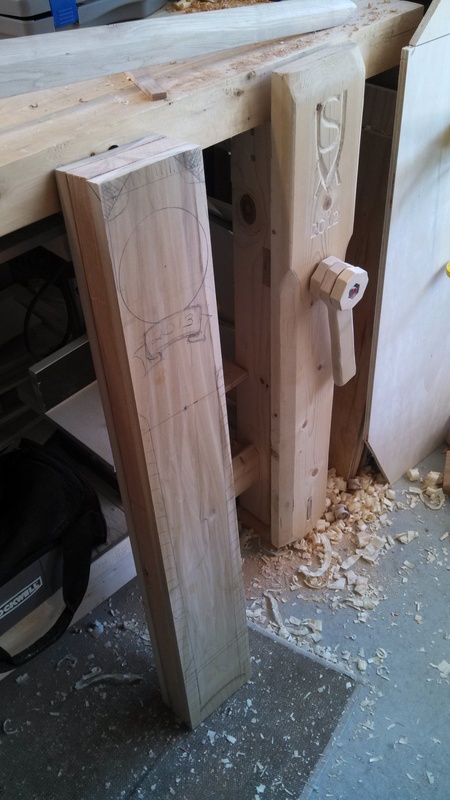 The chop on this vice was simply two pieces of 3/4″ pine, about 6″ wide, glued together and shaped (with some crude tools I had at the time and zero knowledge of what I was doing). 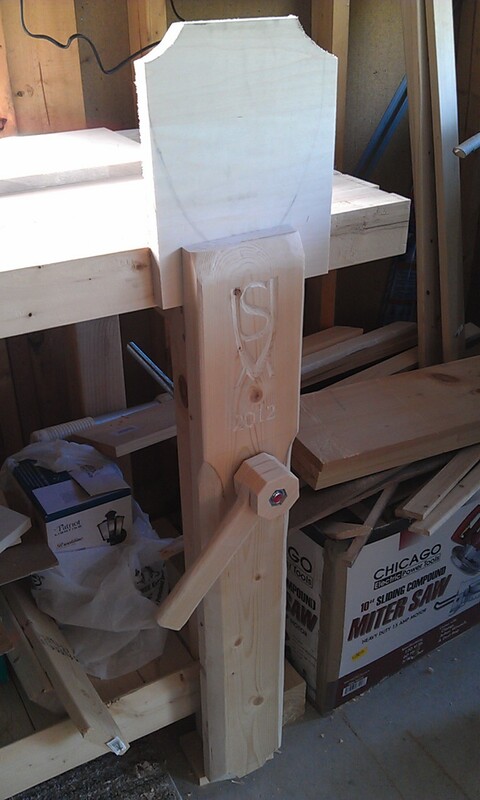 Then I carved my initials and the year of it’s construction (2012) into it and made a nice little handle out of poplar. Well, it works. That’s about all I can say for it. I’ve had to repair it twice (fixing the garter and then redoing the oaken support bar at the bottom that kept sliding through the chop when sufficient force was applied). I’ve noticed it bowing more and more lately. I think the abuse I’ve heaped on it in the past year is taking it’s toll. I can’t complain though, the thing cost me about $6 in wood and glue. But, it’s always had a wobble and lately it’s gotten worse—the chop will sway front to back now by 3/4″. I can still work with it, but it’s irritating, because I know I can do better now that I have a year of woodworking under my belt. I see the bench and look at the crude mortises and rough-cut bridle joins and think, man, if I did this now, it’d look a LOT nicer. Maybe I’m just talking my self into building a better bench, maybe I’m just realizing the humbleness of my first attempt. At any rate, I can fix the chop, cheaply and with little risk of screwing it up this time. I think. So, with that in mind, an idea formed in my head to use some scrap poplar and a chunk of 2×6 I had laying around and make a new chop. And it was so much fun, I just want to do it some more. I figured, why not dress up the bench a little? It’s very utilitarian right now. I want to change that. If I’m going to be looking at something for hours on end, I at least want it to be pretty. Yes, that’s a giant roll of shrink wrap on the bench. The movers left me 2 of these bad boys when they moved us in last summer and it is great for putting under a glue up. I’m going to mount it under the bench on the left so I can just unroll it and cover the bench whenever I need it. But that’s another post. About 5 hours later, I removed the clamps and compared the two chops. Oh yeah, version two is beefier, that’s for sure. It’s at least twice as thick and three times as heavy. I’d say V2 is pushing 10 pounds where V1 is maybe 5. 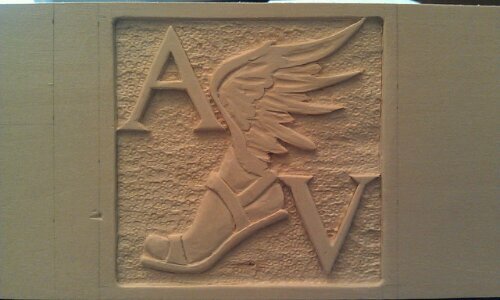 This entry was posted in Projects, Workbench and tagged carving, chop, leg vise, pine, poplar. Bookmark the permalink. That leg chop looks tons more beefy. I used a 2×6 and 1×6 lamination for mine. Seems to have held up so far. One day I hope to get into a little bit of carving. The piece for your mom’s medal chest came out great. 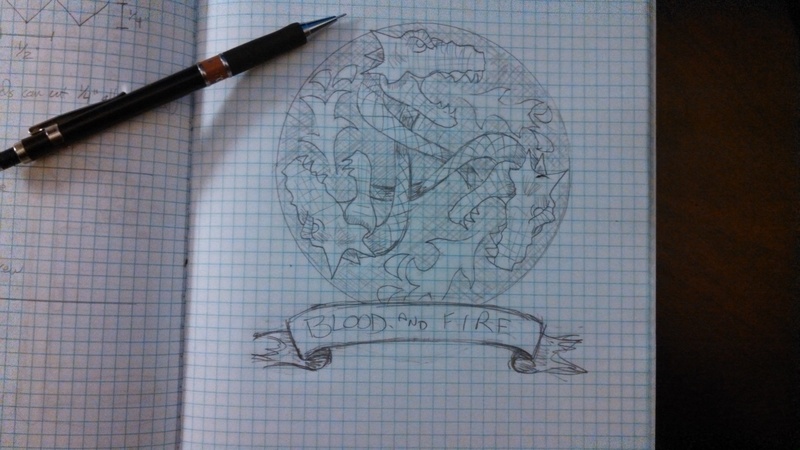 Love me some Game of Thrones so looking forward to see how that turns out! Best of luck! Hey thanks! Glad to hear your laminate chop is holding up, makes me feel more confident! Yep, gotta go sharpen the chisels before I tackle the carving but there always seems to be something else to do…like make a carving mallet! Thanks for stopping by!